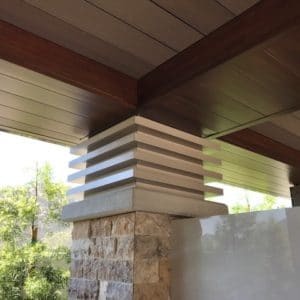 The Western Wall and Ceiling Contractors Association (WWCCA) has announced the 2018 Walter F. Pruter Project of the Year award winners. The Raymond Group accepted an award for the Pala Casino Spa & Resort in the Exterior Renovation category, as well as DCA Sprint in the Themework category. Projects were limited to the Southern California region and judged on overall design, quality of workmanship, and use of materials. This year, the WWCCA offered a new award for Excellence in Safety; Raymond-San Diego, Inc. won the award in the category of 250,000 to 500,000 worker hours and Raymond-Southern California, Inc. won the award for 500,000 to 1,000,000 worker hours. Raymond makes safety a priority every day and currently has an experience modification rate of .65. Raymond’s Southern and Northern California regions have established over two years of incident free operations. DCA Sprint was a renovation of an existing theme park attraction. Raymond performed the GFRP, metal framing, and plaster on the newly themed area. 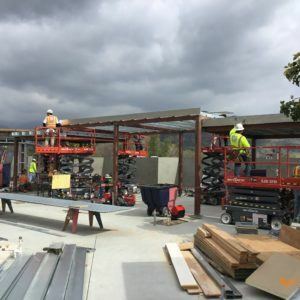 Many GFRC theming components were prefabricated offsite for delivery and installation onsite. Raymond performed themed rock work in multiple areas, helped install landscaping, completed themed design wood decking, and much more! Raymond’s scope of work totaled 5.5 million dollars and was completed in six months. 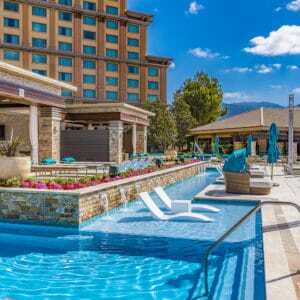 The Pala Casino Spa & Resort’s New Pool Complex was part of a $170M expansion. 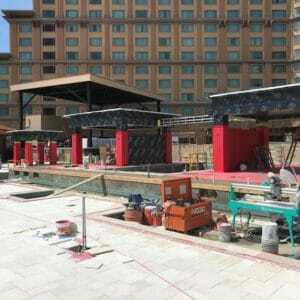 The new space features five pools surrounded by 14 luxury cabanas, two oversized hot tubs, a poolside bar and restaurant and a lounge area with fire pits. Raymond performed the framing, drywall, sheathing, insulation, lath, plaster, aluminum shapes, wood-like aluminum, faux wood, and FEC’s. The WWCCA Project of the Year Awards recognize projects that exemplify the quality of union construction. Projects are judged by a panel consisting of local Architects, the WWCCA and the TSIB.